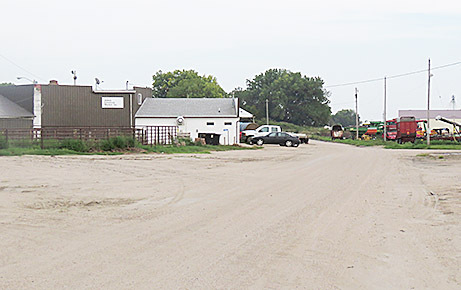 A new water main is planned on Albion’s Sale Barn Road. 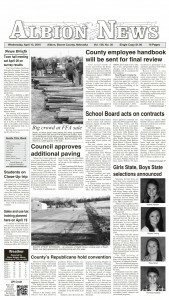 Albion City Council last week voted to proceed with a major water system improvement on Sale Barn Road. Bids are now being accepted on the project, which would replace the existing two-inch water main with a six-inch water main for 1,350 linear feet. The bid deadline is Oct. 6 at 1:30 p.m., and acceptance of a bid will be considered at the council’s Oct. 10 meeting. Total project cost is estimated at $93,430, including engineering. Engineer’s estimate of probable construction cost is $67,000. The council had approved engineering and design work by JEO Consulting Group earlier this year. Another city project, the reconstruction of a portion of east Church Street, was wrapped up with approval of final payment Tuesday night, Sept. 12. The council approved final payment of $19,640 to Gehring Construction and Redi Mix of Columbus for the new concrete street from Second Street to Highway 91. It was noted that a ditch contour will need to be corrected so the ditch can be mowed.